Is This The Greatest Obituary Ever Published In The History Of Death? 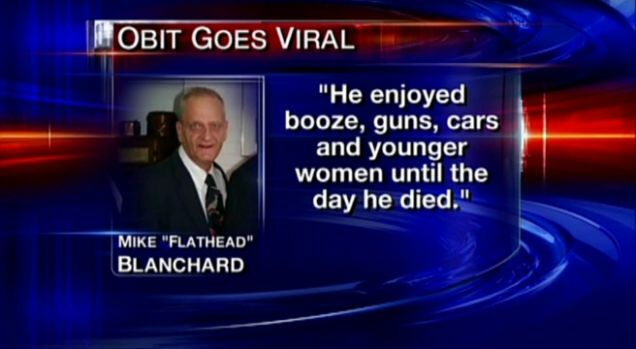 Reports of Michael Blanchard's death may not have been exaggerated, but his obit might be a tad over the top. Blanchard — better known as "Flathead" — was born in July 1944 to unassuming Coloradan couple Clyde and Ethel Blanchard. A lifetime later, Blanchard passed away leaving behind a son, an ex-wife, a brother, two sets of uncles and aunts, an untold number of cousins and nephews, a cat named Chopper, and by far the most badass obituary you will read today. So many of his childhood friends that weren't killed in Vietnam went on to become criminals, prostitutes and/or Democrats. He asks that you stop by and re-tell the stories he can no longer tell. As the Celebration will contain Adult material we respectfully ask that no children under 18 attend. Though Blanchard died nearly a year ago from colon cancer, his family waited until now to hold a memorial and publish his obit, most of which he wrote himself.